This French holiday camping site is located on the tranquil coastline of western France. Yelloh! Village Le Club Farret offers quality holiday camping at highly economical rates.This is perfect even for those who are on a limited budget. Please contact Lux-Camp for further details or if you have any other questions. What Features Allow Yelloh! 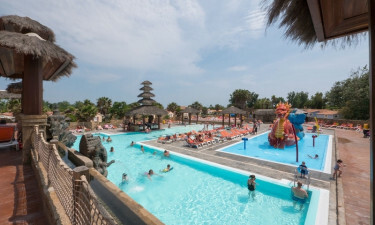 Village Le Club Farret to be a Great Choice for an Upcoming Camping Holiday? Staying in a modern and elegant mobile home. A massive and fun water park for the entire family. Client-centred services including cleaning, laundry and even hairdressers. Fun-filled day and evening activities. The mobile homes found here are comfortable and they are able to fit up to six people. Not only are these literally a home away from home, but all of the modern conveniences that one has come to expect are within reach. These include dedicated power supplies, water, heating, air conditioning and some will even contain a private pool. Although any luxury camping site will certainly focus on rest and relaxation, many visitors here will choose to remain active during their stay. So, there are a number of sports offered at Yelloh! Village Le Club Farret. These include tennis, volleyball, fitness classes and aerobics. 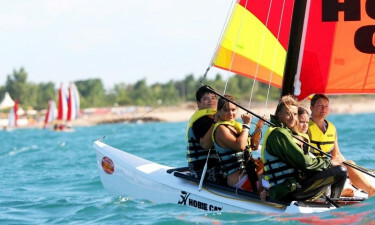 More intrepid individuals may instead choose to take a sailing or a paragliding lesson. Thanks to a beach located only moments away from this luxury camping resort, there are a host of options available. Families with children will be pleased to learn that Yelloh! Village Le Club Farret boasts a number of fun and exciting activities centred the needs of young ones. These include games, arts and crafts workshops and live entertainment. A large gaming room is perfect to keep children entertained for hours while parents decompress thanks to the presence of an on-site wellness facility. Yelloh! Village Le Club Farret is a holiday camping site that is able to address nearly every need imaginable. So, it should stand to reason that a restaurant is located within its confines. While international foods are available, visitors may instead choose to enjoy a tasty regional dish instead. A pizzeria provides a takeaway menu as well. Finally, there is a bar for anyone who desires a drink or aperitif after their meal. This luxury camping site has a grocery store that supplies snacks, camping equipment, bottled water and stationery such as international newspapers. Tourist information, a bicycle hire service and even a safe rental for valuables are all found within the centre of the village.